This shield is really lovely. Simple, understated, but elegant. Looks like it would go well with Truesilver Breastplate and the like. Shamans and Holy paladins need to craft inscription off-hand, this one only got STR version. The RNG can be mean to you on this crafted item. I spent 100 ingots to get a shield with green stats of crit and haste, just what every warrior and pally tank wants! Here's hoping your blacksmithing luck isn't as bad as mine. Anyone gotten Bonus Armor secondary stat on this one? Got a Crit/Haste shield myself atm, and don't want to risk rerolling if there isn't. Use Truesteel Grinders to reroll the secondary properties until you get what you want! Does not change or remove any WoD weapon enchantments that you may have already applied to the item. Remember when directly trading this, and all other Crafted weapons and armor, to check if you're being given the one with the right suffix/enchants. As a side note, when patch 6.1 hits, this will not count towards your crafted limit. For those of you (especially I) with bad RNG, you can finally replace your heroic 5-man shield. 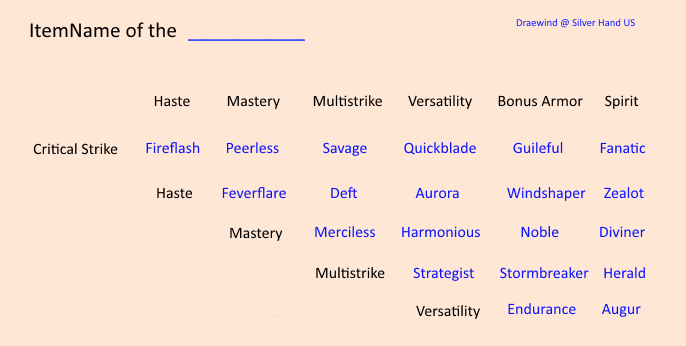 Since I can't find this anywhere, this is the list of mats it'll take to create the shield from scratch and upgrade it to 670: (sorry for the crummy spacing). Below are the base and upgraded versions of the shields. This item maintains whatever stats were on the base item when upgraded - the amount of those stats will increase though. As of 6.2, item level 705 is the maximal upgrade that can be performed on these items. These shields can be upgraded with items created with blacksmithing. Recipe: Mighty Steelforged Essence, sold by the Ore Trader visitor in your garrison - Alexi Hackercam (A) or Trixxy Volt (H). 60 X Felblight Recipe: Savage Steelforged Essence, sold by the Ore Trader visitor in your garrison - Alexi Hackercam (A) or Trixxy Volt (H). I really love this shield´s model but is really weird how it´s positioned in the back of the character cause it overlaps awfully with any one-handed that sheaths on the back. In case you've acquired this shield and love the look but just aren't sure what to wear with it, the colors on the Steelforged Shield perfectly match the Stormwind Set. The Dimensional Blade, Vicious Fur Cloak, and Stormwind Tabard complete the look. You can see the complete outfit here.